If you thought it strange that a person was eating hot peppers with their meal, science says they are loaded with all kinds of health benefits! Peppers are great for flavoring food, but did you know that consuming spicy peppers on a regular basis may substantially extend your life? 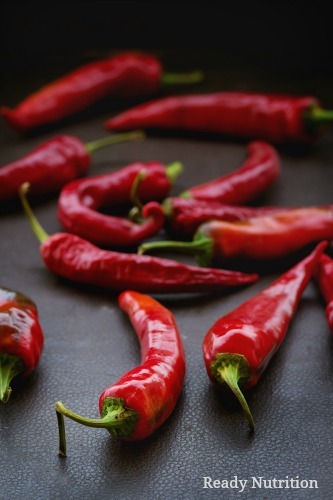 It was once thought that hot peppers were damaging to the intestines and that they might possibly cause ulcers. However, in defiance of this common misunderstanding, spicy foods have been shown to reduce the risk of ulcers by the gradual eradication of the ulcer-causing bacteria, “Helicobacter Pylori,” effectively balancing gut flora in the digestive tract. A 2015 Chinese health study suggests that consumption of peppers shows promise for increasing longevity. The study found that “the habitual consumption of spicy foods was inversely associated with total and certain cause-specific mortality.” From 2004-2008, there were 487,375 participants in this study, ages 30-79, enrolled in the China Kadoorie Biobank, excluding those with a history of cancer, heart disease or stroke. A median follow-up after 7.2 years found 11,820 deaths among men and 8,404 deaths among women. The study controlled for varying family medical history, education, age, diabetes, smoking, and other variables. It was found that consumption of primarily chili peppers less than once a week resulted in a 10 percent reduction of overall risk for death. When spicy food intake was increased to six or seven times a week, the reduction of risk went up to 14 percent. Peppers of all sorts are particularly good sources of Vitamins A, C, K, and B6 as well as Potassium and Manganese. As if these properties were not enough to make the case that you should eat more peppers, there seem to be immense benefits found in the properties that contribute to the spicy nature of peppers. Capsaicin: Found in cayenne and chili peppers, capsaicin is often cited as assisting with weight loss because it has been shown to boost metabolism by raising body temperature and effectively lowering appetite. Capsaicin also has been found to help protect against heart disease by lowering total cholesterol levels in rats given capsaicin supplements. Dihydrocapsiate (DCT): A similar substance to capsaicin, often found in mild or sweet chili peppers, and sometimes called “CH-19” peppers, DCT in capsule form acts similarly to capsaicin in the body, without the associated burning sensation. Piperine: Found in dried black pepper, piperine may prevent new fat cells from forming. However, more investigation is required in human subjects to understand this mechanism. Consumption of piperine can also increase the bioavailability of curcumin, an anti-cancerous chemical found in turmeric root, by as much as 2000%. This means that curcumin absorption is particularly efficient when piperine is consumed simultaneously. The reasons to include fresh, spicy peppers in your daily intake are many. Regardless, not everyone is attracted to the burning sensation from the consumption of these peppers. For those who want to avoid this and still yield benefits, you have two options. One method would be to sautée the pepper for a minute or so prior to eating. The heat will cause the spice to lose its potency and will be substantially less spicy. Remember to wash your hands immediately after making any skin contact with hot peppers to keep from causing irritation to your skin, or you could simply wear gloves and avoid contact altogether. Another approach would be to build a tolerance by consuming small bits of spicy pepper on a daily basis. Gradually, you will find that you are able to handle more of the pepper as you make a consistent habit of ingesting small bits of it. Your taste-buds will adapt to the spice. Don’ t like peppers of any kind. I use turmeric, sage and ginger along with herbs every day. Peppers are also a nightshade, not good for arthritis. OK, call me dislexic — or “lis-dexic” — but on first glance at the title of this article I mistook “peppers” for “preppers”. Of course, I had to read this article first! Pretty funny! Preppers are prepared for you to try to eat them, they will fight back. Forgot the most obvious reason. They are just plain delicious; hot, bell, sweet or otherwise. There’s been no mention of organics here. Grow your own if you can, or buy ONLY organic peppers and tomatoes, as well as peaches, apples, strawberries, grapes, etc. The pesticide load on the Dirty Dozen is tremendous and should be avoided.